" The Lost World " – is a name of the seashore between cape Aya on the East and Arfen-Chair-Buroon mountain in the West. The ridge of cape Aya over the Lost World is sometimes called Kokiya-Kala. This small piece of the seashore less than kilometer long is accessible only from the sea, because it is surrounded by difficult rocks (by the way, one risky descent variant is described in this article). From the sea you can swim light through the end of cape Aya – about 50- 100 m of swimming. A good path goes from the extreme sanatorium “ cape Aya ” near the houses on about 50 m above the sea and descents to the sea in the end. Then you can go to the very end of cape Aya along the shore. With luggage it is easier to swim by a boat (rend it, for example, in Laspi bay), more exotic variant is to swim with rucksacks packed hermetically. (501 m) along the NW ridge, III grade. Cape Aya. The Lost World. Geological peculiarities predetermine the ridge atomism (see route “Uhanovsky”, 2005). If you want to descend to the Lost World, in point ”A” you can leave all the excess and water for the way back. Take most seriously to this route: rescuers won't reach the middle of the ridge for less than 10 hours. ascend time - 4-5 hours. From the main gorge come by easy rocks to the first abrupt ascent with an inclined (45 degrees) pine-tree on it (80- 90 m I grade). In the end of the section turn to the Northern part of the ridge to the ledge with a juniper (photo 2). R7. From R 7, go 10- 15 m along the ledge by the destroyed rocks III - IV grade (15- 18 m , 70 degrees slope, 3-4 hooks), ascend to the saddle (R 8). The ridge 0.4 m wide is very friable. Block up to 1 cubic meter fly down. Rope maneuver must be very delicate. After 25- 30 m (II grade), in widening point, the ridge strengthens. Here the end of the pitch is. then you can bypass the take-off on the right and get over a short corner (up to 8m) with overhang (V grade, 2 nuts 30- 50 mm ). Next 150 m go 15- 20 m lower than the lip of the ridge along its Southern side (II grade). Return to the ridge 2 pitches before its connection with the Main ledge. The reference point is a group of big pine-trees. from the pine-trees (photo 2) fall over the ridge in the upper reaches of the rock sliding couloir on the Northern side. The couloir ends with a pine-tree 0,7 m diameter (60 degree slope, 50 m, II grade). from the balcony above the couloir go 50- 60 m to the saddle of the Main ledge (60-75 degrees slope, II grade) — R 9.
go upwards along the abrupt slab (75 degrees, II grade) and to the left to the pine-trees. ( 90m ). Belay by nuts, juts, trees. go to the upper tower along the comfortable ledge between the pine-trees (synchronous moving). spirally, counterclockwise ascent the tower ( 200 m, I - II grade). In 1992 the route was send run-out in 28 minutes on a bet. Deion and photos - Streltcov S.
route design – Msakeev O.N. Descent to The Lost World from the routes « Шевалье » (Shevalye) and « Свобода » (Freedom) (from Kokia-Kala massif). Eastern side of The Lost World. Descent to The Lost World is extremely undesirable. Its upper part (photo 1: R 17 – R 18 – « А ») goes along the rock sliding walls. In rainy weather descent is impossible. For example, in 1980 it was a mud flow transferring stones up to 23 ton. The flow rate was 90 cubic meters per second. from the lip of the vertical face (III) move at an angle to the west till the hanging slide-rocks 80- 90 m long. Descend by the slide-rocks till the ledge H =20- 25 m, R 17. Apseil far from moving stones till the inclined area, traverse the wall to the east, to the gorge. The distant pine-tree 20- 30 m to point B is yours. R 18. do not go to buttresses! from R 18 descend to the ivy — 2 apseils 40 m each one. Under the ivy the separate comfortable stone is finish. Move along the riverbed very attentively: all the stones are moving. don't forget to reserve some water for the descent ( 0.5 liter per person). Descent duration for party of two is 1-1.5 hours from R III till R «А». The deion is made by Streltcov S., I grade geologist. ( 501 m) along the Southern ridge II grade. Streltcov S., Streltcov M. 1992. 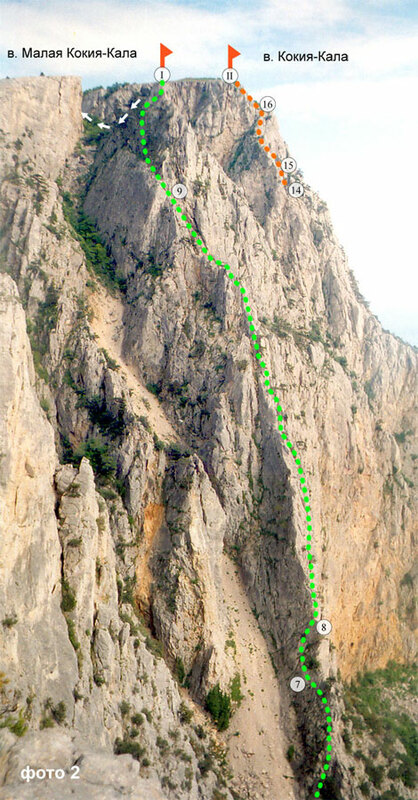 The route was send before the huge rock fall in July 1997, when «B» — R 1 space was less dangerous. Ridge length - 500- 600 m.
Ascent time - 4 hours. It's useful to see « Ухановский » (Uhanovsky) route, 2005 . R Б — R 1 (photo 1). Risky ascend along the moving slide-rocks and buttresses to the next group of trees which is 50- 60 m above the base of the lip. From R 13 to the vertical end of the lip R 14 there are 100- 130 m of good climbing along the cascade of vertical ledges. Slope is 70 degrees III grade. Trees for belay are enough. From R 14 the vertical end can be bypassed on the left with ascent on the inclined stone heap (Slope is 35 degrees), which leads to the abrupt (90 degrees) short ( 4 m ) climbable corner IV - V grade. Leave the peak through the saddle-point on the plateau (photo 2). ascend to the plateau through I grade rocks — 50 m .
The route is poor as for emotions, excluding the view from the peak. The deion is made by Streltcov S..
Route on Kokia-Kala massif ( 557 м ) along the SW ridge II grade. It is the longest route in Crimea : height of the wall is 500 m, length – 800 m. ascent time depending on the group and weather is 3-7 hours. Water is brought 2.5- 3 liters per person. Descent is 1.5-2 hours. It's better to descend to Kazan-Dere, or to Goncharnoe village to Sevastopol – Yalta road. This route is the best view point in the region. Excellent photos are guaranteed. From the landslide (point R « В », photo 1) ascend along the diagonal ledge to the divided rocks (R 10), leading to the saddle-point. By easy rocks go to the saddle-point. (Slope is 45 degrees, 80- 90 м I - II grade.) Belay with trees. After the saddle-point, place R 11 on the area under the corner on the northern part of the ridge. From R 11 go along the vertical chimney ( 12 m, width 0.3 m ) with a jammed stone, and ascend the ridge again. Here III grade chimney is. From the chimney go along the diagonal ledge, which traverses the S wall, to R 12. (25- 40 m , Slope is 70 degrees, II - III grade.). R 12 is on the balcony behind the tree. From R 12 go 10- 12 м upwards II grade till the easy rocks. Attention! From the R 10 - R 12 distance all the stones fall on the camp at the foot of the wall. Tell holidaymakers about it in the evening before the ascent or in the morning of the ascent day. They must transfer their camp to the safe place. From R 12 to R 13 there are 400 м of easy rocks. You can make good photos there. From the pine-tree (R 14) go 9- 10 m upwards along the ridge to the crux stone. There is a wedge under the stone. A loop is put here (III - IV grade). In rainy weather moving is difficult because of moss. Then go 35 m along the right side of the ridge (Slope is 60-75 degrees, II - III grade) to the balcony R 15 . From R 15 to R 16 there is a ridge route I - II grade. 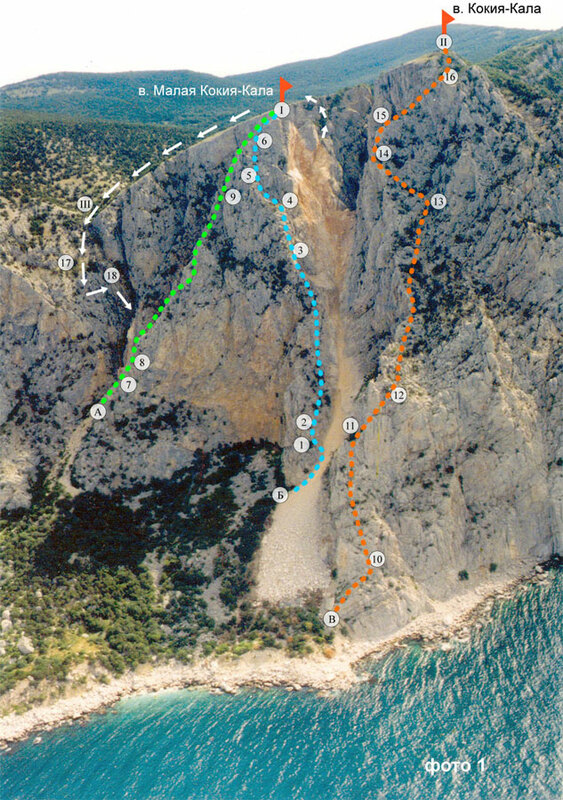 Difficult sections are bypassed on the left from R 15 to R 16 — 90 m .
From R 16 to the peak there are easy rocks. 70 м, I grade.